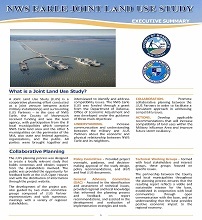 A Joint Land Use Study (JLUS) is a cooperative planning effort between local governments and a military installation, such as Naval Weapons Station (NWS) Earle. Earle falls within five municipalities: Colts Neck, Howell, Middletown, Tinton Falls and Wall. 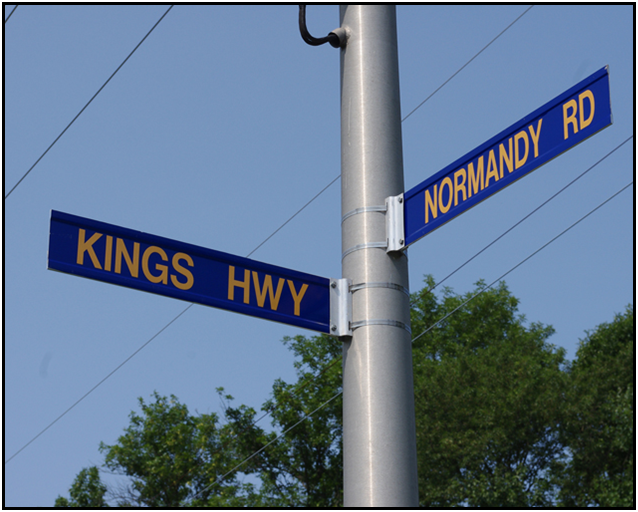 There are 8 additional municipalities considered within the Military Influence Area: Atlantic Highlands, Highlands, Eatontown, Farmingdale, Freehold Township, Keansburg, Neptune, and Ocean. 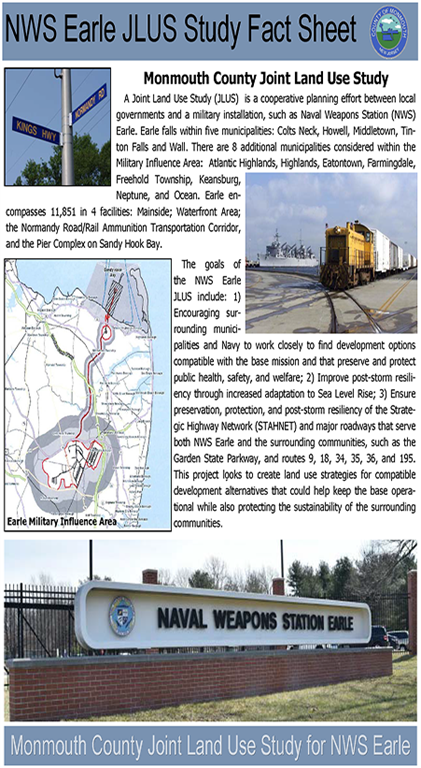 Earle encompasses 11,851 in 4 facilities: Mainside; Waterfront Area; the Normandy Road/Rail Ammunition Transportation Corridor, and the Pier Complex on Sandy Hook Bay. 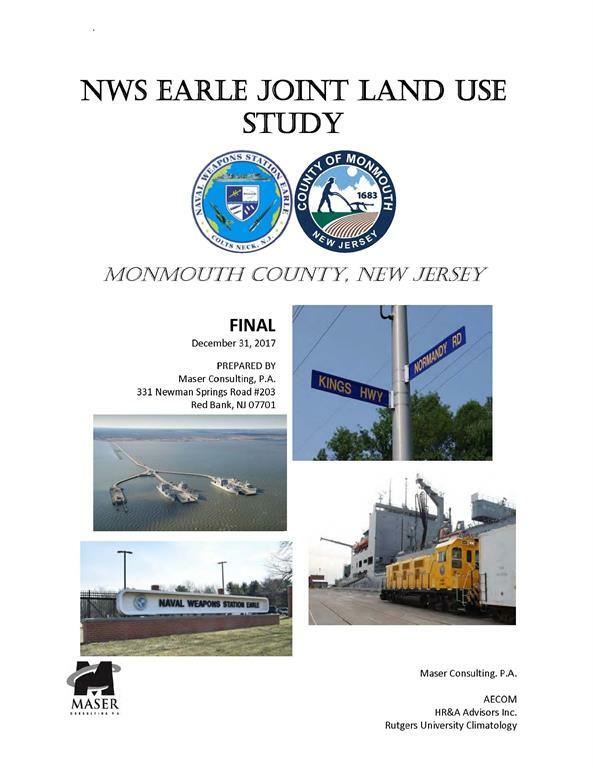 The goals of the NWS Earle JLUS include: 1) Encouraging surrounding municipalities and Navy to work closely to find development options compatible with the base mission and that preserve and protect public health, safety, and welfare; 2) Improve post-storm resiliency through increased adaptation to Sea Level Rise; 3) Ensure preservation, protection, and post-storm resiliency of the Strategic Highway Network (STAHNET) and major roadways that serve both NWS Earle and the surrounding communities, such as the Garden State Parkway, and routes 9, 18, 34, 35, 36, and 195. This project looks to create land use strategies for compatible development alternatives that could help keep the base operational while also protecting the sustainability of the surrounding communities. Click here for the NWS Earle Web Site.